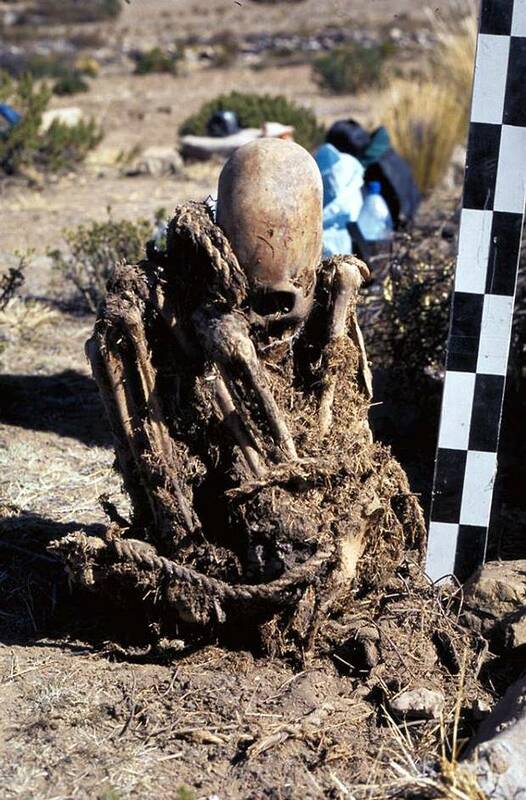 Researchers have recently discovered six new skeletons in Bolivia. Two of them are of extreme interest since they display anomalous, freakishly large, elongated skulls. According to researchers one of the skeletons had an elongated head that exceeds the proportions of an artificial cranial deformation. What could have caused such atypical features? Finnish archaeologists working near the village of Patapatani in Bolivia, recently unearthed at least six individuals buried under an Aymara funerary tower. 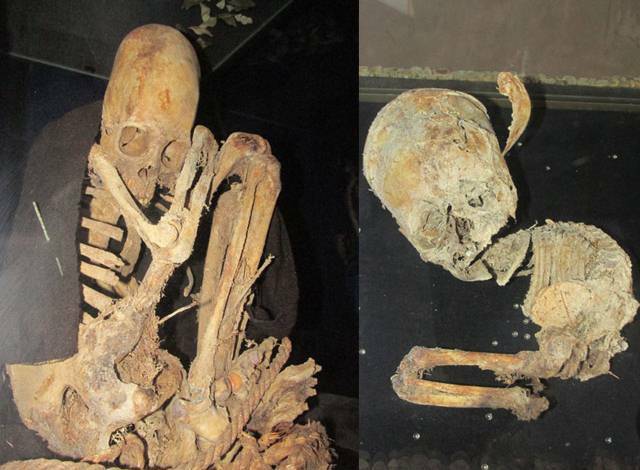 Two of the skeletons – a mother and her baby – were of particular interest since both had freakishly large elongated heads that were not the result of cranial deformation. 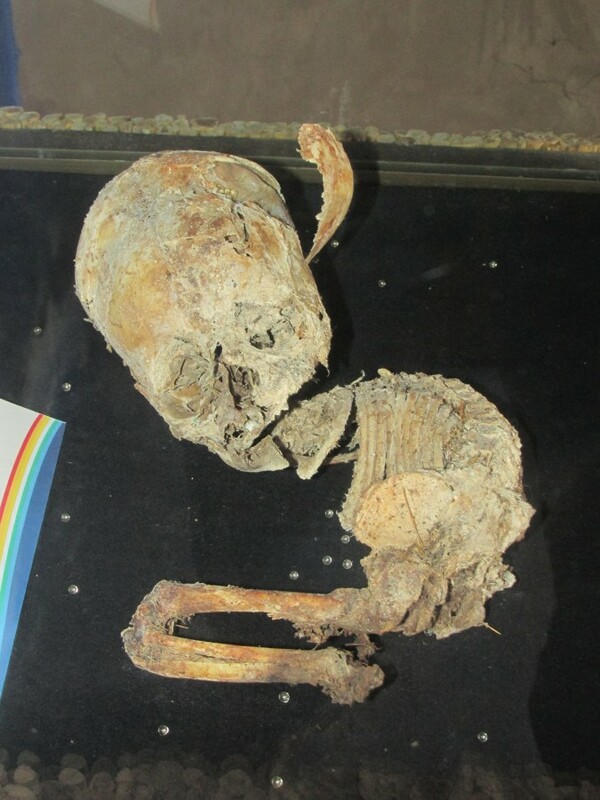 Brien Foerster – known for his extensive research on the Paracas skulls – recently took a trip to the Patapatani museum where researchers transferred the newly discovered skeletons. According to experts, based on the shape of the pelvis, the skeleton we see in the images belongs to a young woman who died in her preadolescence. The young girl had an elongated head that exceeds the proportions of an artificial cranial deformation. The fetus found in the tomb is believed to have died between eight and nine months into development, most probably with the mother during birth. If it is proven to be the case, it is very likely that the baby would have been born with an elongated skull as well, meaning that both the mother and the fetus had similar conditions. Is that a new subspecies of ancient humans that died out thousands of years ago? Apparently, these are the largest stone tools yet found and there have been many huge ones around the world. Who wielded these, do you suppose? Giant Hand-Axe from Sheringham, Norfolk. An altogether remarkable and gigantic hand-axe, discovered embedded in the beach below Beeston Hill, Sheringham, by Mr. J. P. T. Burchell, has been figured and described by Mr. J. Reid Moir (Proc. Prehistoric Soc. East Anglia, 7, Pt. 3). The implement measures in its greatest length 15J inches, in greatest width 6J inches, in greatest thickness 5J inches. Its weight is approximately 14 lb. It was derived originally from the base of the Cromer Forest bed, which rests upon the surface of the chalk. The implementiferous bed runs in beneath the Forest Bed strata and the glacial deposits which form the cliff, some 200 ft. in height. The material of the axe is of flint, the colour of the flaked surfaces being jet black. The ridges and outstanding parts are abraded, and it is striated in places. There is a small area of the cortex remaining, which shows a ferruginous staining. It is a specimen of the ‘platessiform’ type, that is, rhom-boidal in section in the anterior portion and showing the remains of both the dorsal and ventral planes or platforms of the rostro-carinate stage. In two other specimens cited for purposes of comparison, coming from East and West Runton, one is clearly of the “‘platessiform’ type, but the ventral plane is partly transformed into a cutting edge, while the second is equally clearly of the ‘batiform’ type, in which the section through the anterior portion is triangular in section, the lower angles of the triangle representing the cutting edges. Hand-axes showing these characteristics have been discovered not only in England but also widely distributed over the earth’s surface. The numerous specimens discovered in the basement bed, belonging to the early Pleistocene epoch, are as highly specialised as are those of any later prehistoric period and represent a very definite and necessary stage in implemental development. No adequate explanation of the purpose which the gigantic size of the Sheringham axe could serve has been offered. Scattered around the area were a great many artefacts of stone and of pottery (seemingly now all stolen in recent months). Many of these objects appeared to be stone tools that could have been used either in mining or refining some kind of metal ore.
Amongst these tools are some that would be extremely difficult for a normal size human being to use in any practical fashion, this has led to a strong suspicion that this is one of the legendary lost cities of the giants, well known in local Ecuadorian legends about the Amazonian area, such places generate great fear among the members of today’s jungle tribes as they are believed to be protected either by spirit guardians or by beings not of this world. ​Many explorers have gone into the jungles around this area and failed to return – it is certainly known to be dangerous to enter for the foolhardy traveller. Even the most expert explorers have vanished without trace in the hunt for lost cities and the supposed existence of immense treasures to be found. Stories of giants living peacefully in complete harmony with nature have touched our ears from the earliest of ages. But who knew those stories were based on real events with ancient giants that once ruled over the lands surrounding the Carpathian Mountains? Around 3500 BC, an enigmatic civilization called the Agathyr, belonging to the Scythian tribe, built an underground system of tunnels, today known as the Hyperborean Gallery. Whatever it kept hidden away from sight for thousands of years was uncovered in 1970s by a group of archaeologists, in today’s Rosia Montana, in Romania. The series of discoveries made in those subterranean galleries and in the vicinity of the excavation site are of such magnitude, that it can question the content of all our history books. Archaeologists unearthed unique gravestones with a surprising chemical composition: gold, granite and wolfram, unlike the ordinary gravestones made of average composite stone. 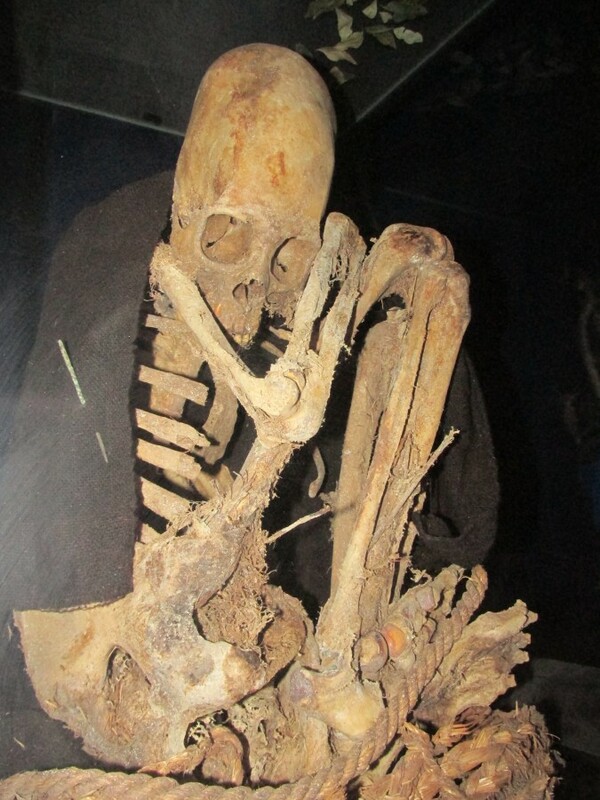 But the greatest finding in the underground gallery were the 33 feet-tall (10 meter) humanoid skeletal remains. Apparently, local legends about ancient beings were not far from the truth, since people share these tales with very little differences from region to region. Most legends tell about giants who made home inside the mountains and were the source of many unusual sightings in those lands. A fine example is the mountain formation called the Pillars of Tainita, which pretty much looks like a set of chairs, believed to have been raised by the giants to serve as seats in their council meetings. One fascinating legend involving an act of creation by the giants tells that ages ago, on top of the mountain in Hateg County, two cities were built by two female giants. ​After they completed building their cities, one of the giants got jealous on the other’s more beautiful achievement and in the midst of her consuming rage, she tossed an incredibly immense boulder at that settlement, creating a large gaping hole in the mountain, thus giving birth to the name of Severed Mountain. 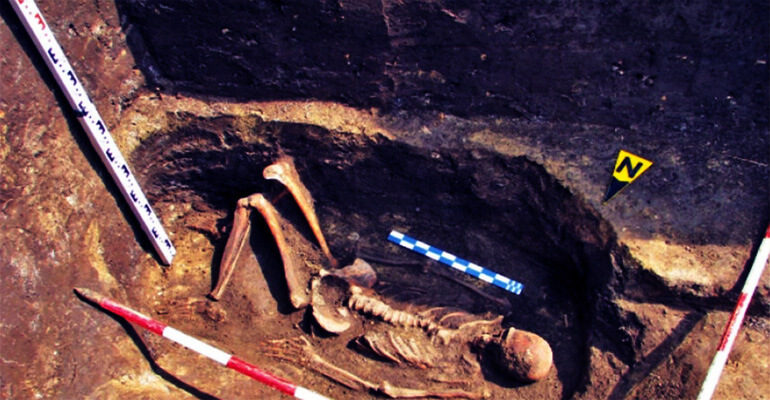 Across Romania, plenty more giant skeletons have been found and excavated throughout the last century. In the 1940s, a mass excavation revealed 80 humanoid skeletons that measured approximately 5 meters long (16 feet). Another place in Romania, called the forest of Oncesti, is the allegedly home of the Giants, as it is described in the folk lore. In 1989, 20 giant skeleton remains were found in the town of Lebada, Pantelimon, in Romania. The Romanian mountains are famous throughout the world for the accidental discovery of a secret tunnel network underneath the Bucegi Mountains. Although many giant skeletons have been exhumed in numerous places in Romania, in a short span of time, many of those paramount discoveries were reportedly destroyed or simply went missing. We can only hope that more sleeping giants await to be brought to light, since Romania appears to have an enormously rich folklore that gets more realistic with each unearthing done by those who seek to unfold humanity’s forbidden history. There are other similar lost cities of giants throughout the world. Strikingly similar evidence was found by archaeologists in Ecuador, in a large pyramid complex located deep within the Amazon. So it is clear that these giants were to be found all over the globe. So far, from all the places on our planet, Romania is a major center of solid evidences pointing towards an ancient race of human-like giants that lived in these parts for generations, long before the rise of man and probably some time afterwards. We learned later that, while that was partially true, it was not the whole issue. Dził Nchaa Si An, as Mount Graham is known in the Western Apache language, is one of the four holiest mountains in the world for the Apache and is considered sacred to all of the region’s native peoples. And it is so because it is what we might call a “stargate” in their mythos, a portal through which “the Star People” have come since the dawn of time. Once we understood this fact, our suspicions as to why the Vatican and NASA had chosen this mountain in particular, even being willing to face a prolonged legal battle to build three telescopes on Mount Graham (including the largest binocular telescope in the world where the LUCIFER device is kept, as thoroughly disclosed in our book, Exo-Vaticana), went into hyperdrive. We also came to learn that the San Carlos Apache have preserved ancient tales concerning this geography, including stories very similar to biblical chronology. These legends involve a creator, a deceiving dragon that follows, an epic flood, and even a race of giants known as the Jian-du-pids, who were judged and destroyed by God. According to the legend, a…race of…Indians called the Tuar-tums lived in the valley as peaceful farmers. They prospered until one day they were invaded by the Jian-du-pids, described as goliaths who used tree limbs for toothpicks. These Nephilim, led by a massive man named Evilkin, allegedly came from the Northeast and were headed south to their home beyond the Gulf of Baja. before they hid themselves underground in the mountains and Father Sun threw a huge fireball that seared the monstrous Nephilim into the scorched mountain rock. While no single Apache Creation Myth dominates all tribal beliefs, most groups share key precepts as well as symbolism within their oral histories. Following this initial investigation and in media interviews since, we have been inundated by requests from hundreds of people asking that we continue this research, especially as it involves stories from around the world of specific geographic locations—very often tied to mountains—where intelligent beings have been reported for thousands of years traversing portals/stargates/wormholes. But to satisfy this request, one big problem was ahead, one we knew we would have to overcome. It would make us face the same type resistance the Vatican had come up against: distrust by American Indians who have been burned too many times by New-Age whackos who misreport their legends in order to make a buck. 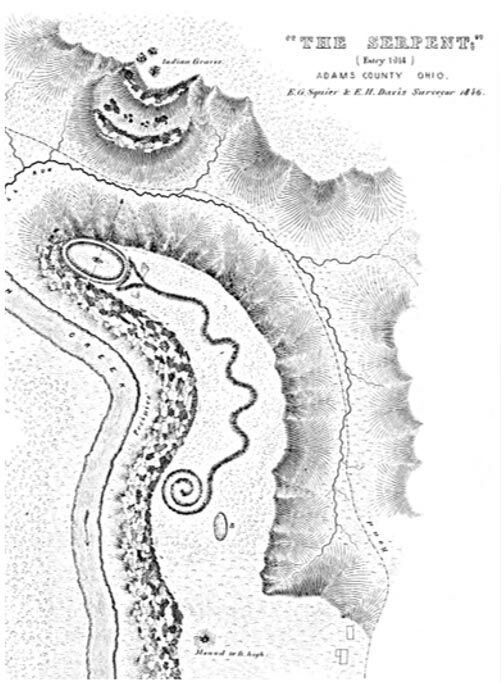 Mountain portals that are universally associated by tribes with deities, spirits, and history connected to Mount Graham and other locations are often deemed “holy” and unavailable to nontribal members. As a result, I was personally warned not to pursue these sacred locations where, in both modern and ancient times, “spirit lights” (UFOs?) have moved through the portals there, something that seems to contribute to the indigenous peoples’ attribution of “powers” and metaphysical phenomena. My team was further told we could be arrested and that our cameras and equipment would be seized. Given that the reservations have their own legal system and could represent a terrible situation for us if we wound up trying to get out of their jails, we determined the first thing we had to do was to get permission from the tribal nations themselves before venturing into restricted areas. At first, all of our requests were rejected. We then began asking if we could hire guides from the reservations to take us into areas such as the ancient Anasazi (mysterious pre-Pueblo Indians that built hundreds of magnificent cliff-side dwellings along the Four-Corners area of the United States and who then disappeared “overnight” without explanation). That, too, was met with a negative response. Of course, if we wanted to just wait until spring, we could get a hiking permit from the National Forestry department and travel by foot into areas that are not cordoned off and that are available to the general public—but we wanted more than that. Time slipped by as 2013 came and went, then 2014 was winding down and just when I was starting to think we would never get permission to visit the off-grid sites or to conduct actual interviews with tribal leaders, we launched SkyWatch TV and hired two investigators to join our team—Carl Olafsen and Allie Anderson. Because we wanted this new television enterprise (you can check it out online at www.SkyWatchTV.com) to do what no Christian broadcasting ministry had offered before—including investigative reports and full-length documentaries involving on-location and original field footage and research—Carl and Allie’s job would be to take the lead in opening doors to get us where most people are normally forbidden. They found this to be especially frustrating in this case, given the well-earned mistrust natives have of nontribal members in particular. Every time it seemed a door was about to open, it would slam shut. This happened partly because we were being forthright about our intentions: that we have a Christian and prophetic worldview and that we wanted to rebroadcast footage of the sacred locations and peoples under our investigation—all big no-no’s among most indigenous peoples. At one point, the Navaho Nation approved on the phone an interview we could have with a tribal elder (who had been a US military code talker and convert to Christianity whom I was anxious to meet), but later permission was withdrawn when the US government agreed to pay a $554-million-dollar settlement to the Navajo tribe to settle a legal dispute,[ii] which pulled all tribal elders into meetings and made them unavailable to our cause. Even so, our persistence would eventually pay off. Now, thanks to Cris Putnam, SkyWatch TV can broadcast images of a similar (or was it the same?) craft that decided to make an appearance for our crew on location. You will also see some “stills” of these images in Cris’ report in the upcoming book. Cris Putnam in Sedona, Arizona—on the Path of the Immortals. At the time Cris was returning from Arizona with this amazing photographic and film evidence of strange happenings there, my team under Carl Olafsen and Allie Anderson was just packing up to leave for the Four Corners area of the United States. It wasn’t much, but the Navajo Nation had agreed to let us interview Miss Navajo at their headquarters in Window Rock, Arizona. She was to tell us their creation story in both the native tongue and in English. If this “feeling out” process went well, it was possible we would get a sit-down with a tribal elder. From there, we would travel across the border to Montezuma County, Colorado, where a Cherokee guide would take us down into the canyons to see what was behind the forbidden gates we were warned not to go beyond under risk of arrestment and property seizure. Even then, on that mild winter morning in February, 2015, as we packed our all-wheel-drive SUV for the off-roads adventure, we could hardly have realized how much more this trip would pay off, or the doors that were about to be opened and closed. At the last moment, Miss Navajo pulled out of her interview (it seemed to me she was too afraid) only to be replaced by a much bigger opportunity—one that is very rarely made available to the white man. We began our trip driving up through the Rockies near Hesperus Mountain, the highest summit of the La Plata Mountains range. The prominent peak is located in San Juan National Forest, which would take us near the Town of Mancos in Montezuma County, Colorado. Hesperus is one of the Navajo People’s Sacred Mountains, and is called Dibé Ntsaa, which marks the northern boundary of the Dinetah, their traditional homeland and place of the Ute people. As we moved along these switchback roads, gaining elevation, occasionally there would be a break in the cedar trees, revealing wind-crested patches of snow reflecting the light of the midday sun. We discussed how the peaks of these mountaintops with sandstone formations at their tips could easily be used as places of concealment, observation, and defense—something we couldn’t help believe was strangely connected to the mysterious Anasazi and their “Alien Enemy” we had come here to investigate. As we discussed these possibilities while navigating a final switchback before our first destination, the drive suddenly became precarious, as lingering patches of ice clung to shadows on the asphalt and mule deer that had been feeding on the buffalo grass alongside the highway decided to cross the road in front of us, darting out from between the sagebrush and patches of snow. Carefully passing through that situation to the egress just beyond, we reached our assigned meeting place to find the Cherokee guide already waiting to take us behind the locked gates. He was roughly five feet seven inches tall, with deep brown eyes, which studied us from under his wide-brimmed hat as we approached. His face, chiseled from too much sun exposure, hinted at what his forefathers’ classical Indian physique must have looked like with his long, black hair in the traditional ponytail. He extended a warm but small, brown-skinned hand, as Carl Olafsen greeted him with Yá’át. (“Hello” in Diné, the tongue of the Navajo.) Carl understood that “Yá’át’éh” is “Hello good friend,” but he had been advised not to be presumptuous and to keep it to the shorter greeting. “Nah, it’s Yá’át’éh,” our guide corrected, smiling again and shaking Carl’s hand, embracing it with both of his as he laughed. As we gathered our gear, including camera equipment, our guide put on a backpack and our cameraman adjusted for light. Moments later, we headed out on foot, listening to Carl as he continued practicing what little he knew of the native tongue while never quite matching how gently the Cherokee man’s consonant pronunciations fell upon the ears. The air was crisp but not too cold, with a light smell of cedars, as we set out along the course he would have us follow. While the team had thought it would be important for me to tag along, I intentionally strayed back a bit, letting Carl and Allie take the lead. This was my way of silently acknowledging any relationship we had with this man or the others we’d be meeting during this expedition as having begun with Mr. Olafsen and Mrs. Anderson—exactly what I had hired them to accomplish for SkyWatch TV. But it didn’t take long before I started rethinking that approach. Maybe I should narrow the gap for safety reasons, I thought to myself as the uneven route quickly required increasingly special care. The path was also getting steep, and I was puffing, struggling to keep up with my younger compatriots as I placed my bad leg carefully down along the safest parts of the trail. More than once I had to stick my hand out to steady myself, as loams of earth and plant life would slip away if I moved to close to the route’s edge. On one occasion, the cameraman right behind me must have slipped on ice, as suddenly his arms flailed, he teetered, then grasped at anything he could reach in order to catch his balance to avoid falling headlong over the hill. He captured a solid area with one foot, dug his heel in hard to correct himself, caught my shoulder, and used it to steady himself. I saw the expression on his face as he considered the incomprehensible river of rocks and brush he could have fallen into deep within the canyon below. Just ahead of us after that was an avenue that stopped at a mountain head, and I could see the path we were following turned sharply to the right there. Where it would lead us beyond that was obscured by a mix of pine and juniper trees, yucca, serviceberry, choke-cherry and Gambel oak; buttresses of something artificial could be glimpsed through breaks in the trees carved out against the rock wall ahead. As we moved toward it, our course widened, leveling off onto a plateau that temporarily provided an easier gait. We moved quickly along this section toward the narrow opening in the trees, then started uphill again over an area still spotted with patches of ice and snow. Eventually, the hillside steepened again and the trail zigzagged. I found myself dragging once more up the precipitous route, struggling to lift my weight, grunting and scaling the arduous hill like the old man that I am, until soon I really was physically spent. I paused, dropped my forehead against my arm, wiped the precipitous sweat from my brow, rested a few seconds, then pressed on until my heart pounded so hard that I thought it would explode. Breathing raspy, chugging the cool mountain air with increasingly painful gulps, I started questioning in my mind whether the demands of this mountainous trip were simply more than I had bargained for. Then, something happened. We rounded a bend in the path and caught our first glimpse of something very huge and artificial coming into view a few hundred feet away, the magnificence of which instantly reenergized my resolve. In fact, all of the team members who had been ahead of me and the cameraman had stopped at that point and were waiting for us. They were in awe, as were we. The 'entity', he says, stood on two legs and approached two U.S. astronauts,that he would not name, for one minute and seven seconds in the space shuttle bay. 'I love my planet, I love our human race. I'm trying to serve all of you, if only you will let me,' he tells viewers.